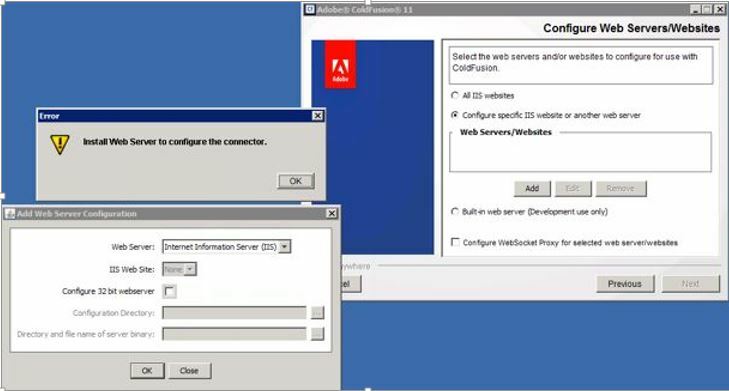 Ever landed in a situation, where you are creating a connector in ColdFusion and the IIS sites are grayed out. This happens due to the missing Microsoft Visual C++ Redistributable Package. ColdFusion installer installs the package during the pre-installation itself. But in some cases, it fails to install or isn’t installed successfully. Since this is a windows utility, CF will throw any error or notification. What is the fix then? You need to download and install the Microsoft Visual C++ Redistributable Package from here or probably the latest VC++ Redistributable Package from Microsoft’s site. Relaunch the “Web Server Configuration Tool” or restart the installation and you will be able to see the sites listed then. Caution: Download the 32-bit/64-bit as per your system specification. ← No more ColdFusion 9 Security patches/updates by Adobe, as “Core Support” ends after December 2014. Hey, one other thing: your blog has itself “gone grey”in recent weeks. Are you seeing it as an all-grey backround with dark grey text? The lack of contrast makes it hard to read, and it seems a mistake. Yes, it could be possible, that if you have another copy of the web server config tool open at the same time for the same version, the site becomes grayed out. But, this then becomes a rare case and the first instance of wsconfig tool will definitely have the sites displayed. The later one(s) will have the sites grayed out. But, its worth to check though, as you say 🙂 . I remember, we discussed this. This is logged internally with us and will be taken care.